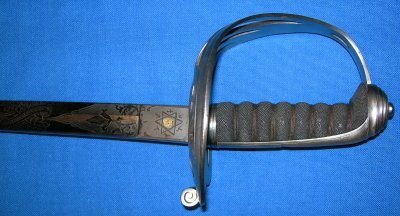 In very good condition, a superb Victorian London Rifle Brigade officer's sword, name to Edward Douglass. It certainly is not necessary for us to tell you that this is a superb Victorian rifle regiment officer's sword in lovely condition, as the photos clearly show this. Etched with "London Rifle Brigade", "Edward Douglass", Victorian royal cypher amongst scrolls, plus the original retailer's name "Kemp, Leddell & Co, Armourers, London Wall, London." The curved 32 3/4 inch blade is in very good order, some metal aging but not very much, firm in the hilt. The steel hilt very good, the fishskin grip and twisted grip wire bindings also well above average. The patent black leather and steel fittings scabbard is aged, particularly the leather, but is good and sound overall. The sword sheathes and draws very well. 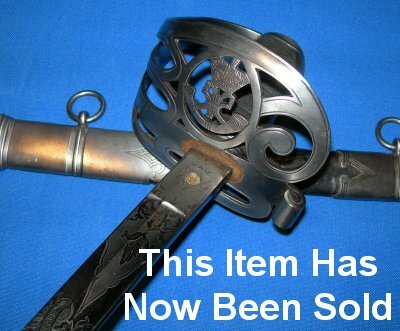 A stunning example and with original owner details means our price is genuinely on the low side and this sword will only appreciate with time and care. Further / full sized pictures available upon request. Please quote item reference number D23 (718).